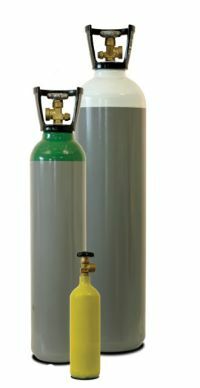 The new 50 Litre cylinder to suit business using 2-3 or more cylinders per year. The 20 Litre Trade gas, a popular choice for the workshop, garage and larger projects consuming two or more cylinders per year - big enough to last and convenient to move around especially under car lifts. The 9 Litre Hobby gas is ideal for the home and low volume user; always there when you need it. Light and portable will suit any machine application at base or on site. Our Hobby cylinders are equivalent to 21 x 600ml disposable cylinders or 13 x 1L disposable cylinders. The 2 Litre Portagas, as the name suggests, extremely portable or if required easily stowed for home use with aquatics or hydroponics. Acetylene - the primary fuel gas for welding and general cutting. Propylene - the new cost-effective alternative to Acetylene for many tasks including cutting and brazing. As a stockist for Rectory Gas we can offer a full range of cylinders to suit domestic and commercial requirements for Propane and Butane at competitive prices. Will non contract work for me? Not always, especially for high volume users. However, it will give you complete control and flexibility for extra or spare cylinders and for infrequently used products. There are no hidden costs or charges and definitely NO MONTHLY RENTAL, you can collect at the listed premises or in certain areas delivery is available for a small charge. With all our gases you simply pay a one off - refundable - deposit and pay for the gas as you go. You can hold as many cylinders as you require and change products to suit your needs. They use the same regulator fittings as BOC, Air products, Air Liquide and Calor Gas. When you return the cylinder we return your deposit - simple. The deposit on the cylinder is held by Adams gas and is fully refundable on return of the cylinder, at any point and is not subject to a limited time frame. Customer deposits for Rectory gas cylinders issued by RentFreeGas will be held by RentFreeGas. The deposit will only be refunded to the account holder, should the cylinder be passed on to a third party, please notify us to avoid any confusion later on. The cost of the cylinder deposit is refundable on a sliding scale, based on the length of time the cylinder has been in your possession. Please refer to Gas-UK Terms and Conditions page for further information on deposits. All cylinders are owned, maintained and tested by Adams gas, Rectory gas and Gas-UK respectively and are never at any point owned by the user. To check the test date of a cylinder, please look at the coloured ring around the gas valve. Any personal data given is stored purely for invoicing and accounting purposes. No information will be passed, sold to or shared with any third party or organisation. Information will not be used for contact without permission except in circumstances of product safety issues.